Update: The battle against ‘currently unavailable’ amazon listings continues… this one is out of stock. As usual I will keep an eye and update when it returns. Two suggestions in the meantime. First, check out this model from Bluefin, which has a big discount (at the time of writing) and ticks all the boxes that the DTX one did and a couple more besides. Second, I have a page which compares the Best Vibration Plate Trainers – check it out via the link! Summary: This is a solid vibration plate massager from DTX fitness, a respected brand who make many different types of weight training and home exercise equipment. 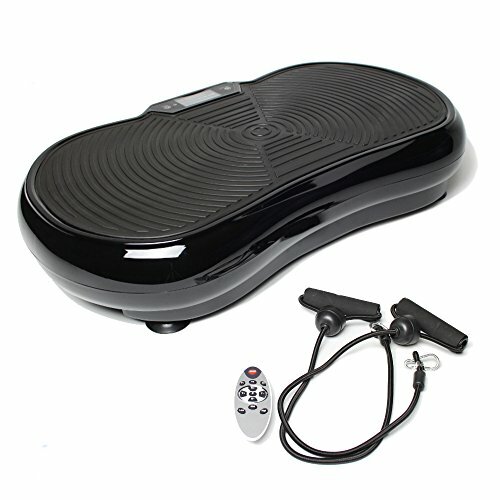 The lower price point is significant, as those who have not yet tried vibration plate exercisers can give it a try. So far, the feedback from buyers has been excellent. For a vibration plate exerciser from a well-known brand at an lower price point – this DTX machine ticks all the right boxes. Check out the dedicated product page over at amazon.co.uk for more information. What you’ll get is a solid floor standing unit, which has a shaking plate on top. This rapidly vibrates, so you’ll need to tense your muscles to resist the shaking motion. This is a sturdy unit, weighing in at 22kg, and is only available in a smart black finish. You will get a remote control unit (in addition to the control panel on the machine itself). There is no arm rest with this item, see the Confidence Fitness Vibration Plate Plus if you’d like one with an arm rest included. What you will get are elasticated arm bands. These allow you to work out your upper body at the same time as enjoying the lower-body resistance training. DTX Fitness are known for quality machines, and the anti-jamming and anti-static protection in this unit are welcome additions. The maximum user weight for this vibration plate is 175kgs, which is 27.5 Stone. There are a total of 99 speed levels for the vibrations. This is positive – you can up the intensity as you get more experience (and more muscle tone!). These can be broken down into 3 pre-set speed options and there are also 3 pre-set programs. So far, the feedback / comments from buyers has been hugely positive. This plate is reasonably new at the time of writing, and so there is only a small amount of feedback. One commenter mentions that it is not easy to move… the machine needs to be heavy, as the vibrations would not be possible on a flimsy unit. One question in the Q&A asks about wheels. I can only imagine a comedy YouTube video which would result in intense vibrations on a wheeled unit! (to be fair, these could have been extendable!). Every other comment has been very positive. With people mentioning the value for money, as well as the effectiveness of the vibration exercises. The fact that there is a remote control comes in for some individual praise – it can be tricky to bend down and change the settings manually with that shaking going on after all! A value vibration plate exercise machine from a well known brand name – and with some excellent feedback from buyers. The DTX Vibration Plate exerciser certainly ticks the right boxes. I’m looking forward to see how the feedback / star-ratings hold up (this is a newer item, and so needs some more time to collect this). Judging by what people have said so far – this should be positive. Check out the gallery and the latest user feedback for yourself now on the dedicated amazon.co.uk product page.